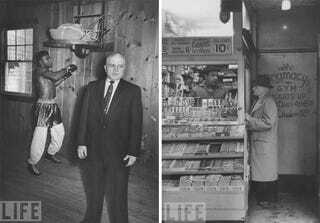 In those days, you had to pass a small candy stand to get to the door of the Gramercy Gym on East 14th Street. The door was heavy, with painted zinc nailed across its face and a misspelled sign saying “Gramacy Gym,” and when you opened the door, you saw a long badly lit stairway climbing into darkness. There was another door on the landing, and a lot of tough New York kids would reach that landing and find themselves unable to open the second door. They’d go back down the stairs, try to look cool as they bought a soda at the candy stand, then hurry home. Many others opened the second door. And when they did, they entered the tough, hard, disciplined school of a man named Cus D’Amato.